Bar stools aren’t just for the neighborhood pub. You can spruce up your kitchen with a rustic style, pub-themed ambiance, or functional, comfortable seating. You’re going to want strong craftsmanship and materials that are long-lasting and visually pleasing. They might be fashioned from wood, steel, iron, or any material strong enough for the job. These 10 stylish bar stools aren’t the entire catalog of available items, but they are representative of the best of the bunch. For a rustic look among vintage bar stools, give Ashley Furniture’s creations the once over. 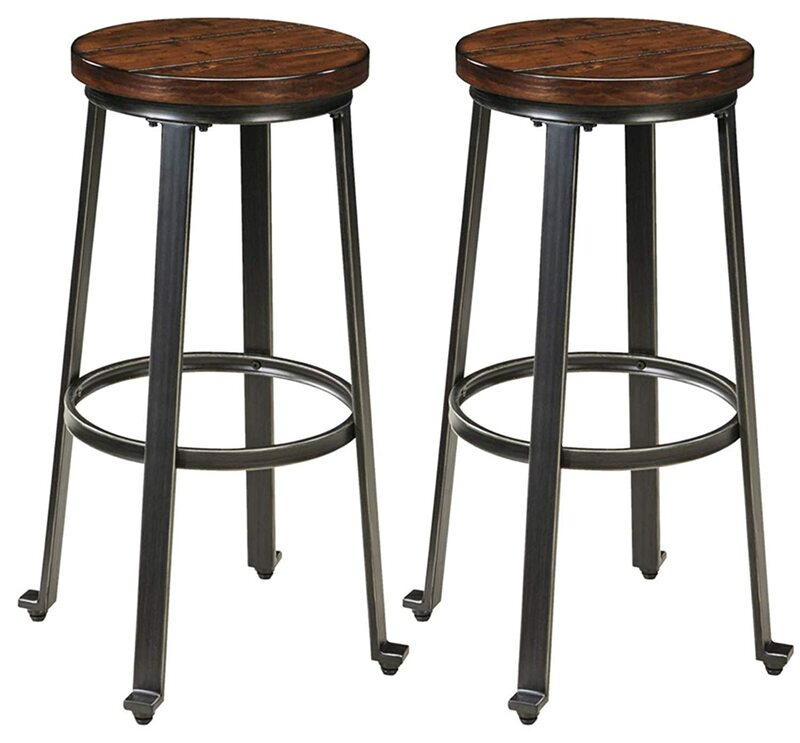 These stools are 29 inches high and look terrific next to a counter or a high breakfast nook table. The legs are adjustable for stability with foot levers, and the seat is engineered wood. The black and brown color scheme fits in neatly with almost any other without losing the stools’ bucolic charm. This pair of stools is easily assembled using the included tools. The walnut color of the Winsome saddle-seated stool offers a comforting look in almost any surrounding. This stool comes in two heights: 24 inches and 29 inches. Mix and match the heights for use by counters or lower tables. 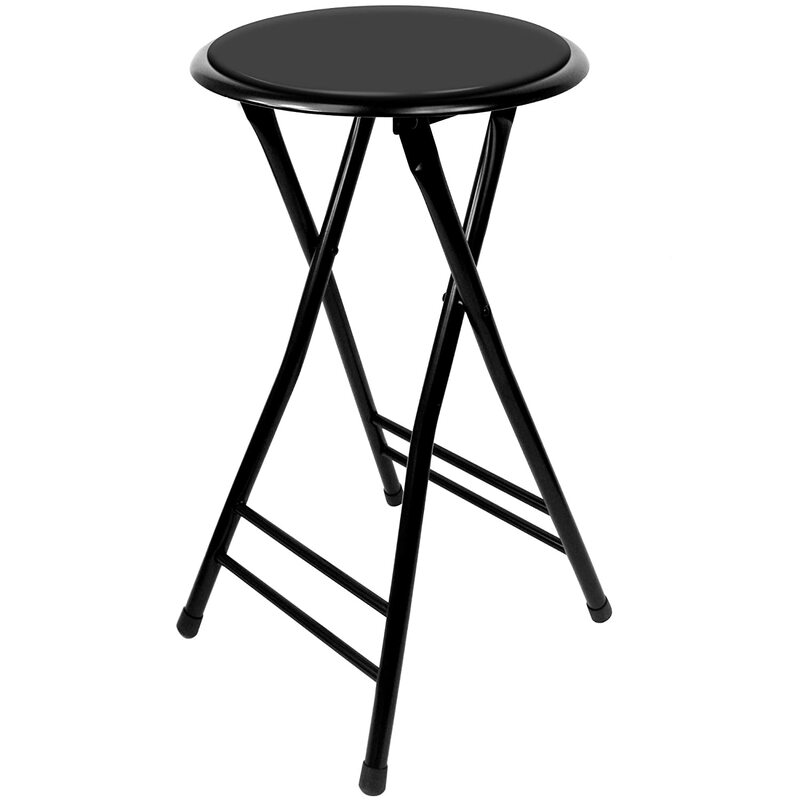 It’s not difficult to move the stool around the house, either, because it weighs a mere 11 pounds. 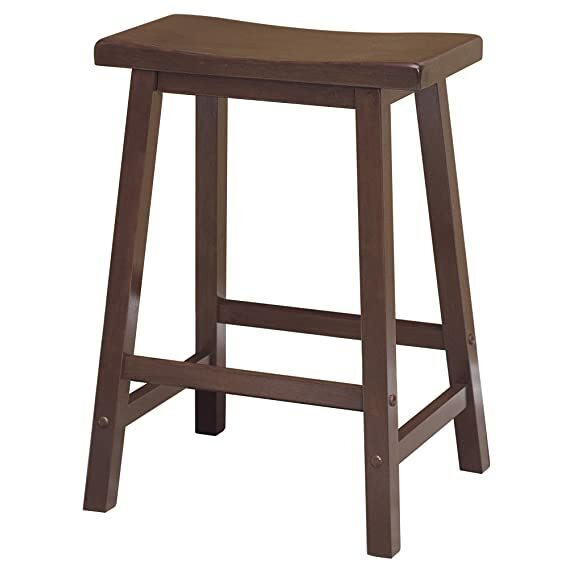 Despite this lightweight, among rustic bar stools, this one stands out for its solid-wood construction and simple charm. Although assembly is required, the tools are included! Some people like their stools cushioned, and this Nathan James item delivers. The cushion is upholstered in durable polyester fabric for long life. It has a flat top, so even though it’s 29 inches high, it tucks easily out of sight under the counter for an uncluttered look. The grey and white color scheme is neutral enough that it fits with any kitchen or dining room decor. 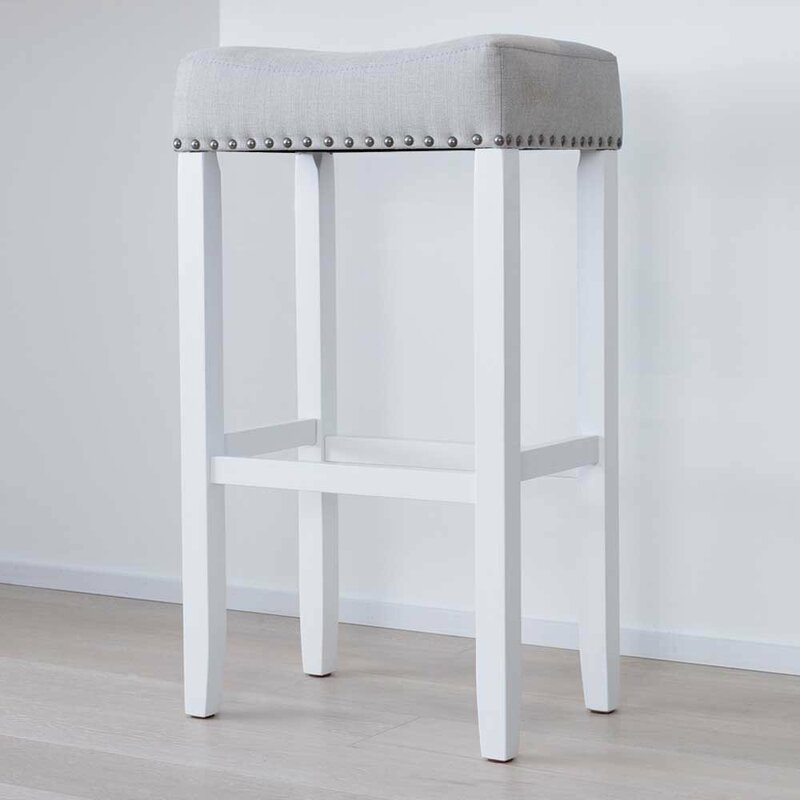 Its charm fairly screams, “Pull up a stool!” The fact that the stool comes with a 90-day satisfaction guarantee and a five-year warranty is just a bonus. Many people also prefer backs to their stools, making them extra-high chairs. The DHP Luxor stools in gunmetal grey fulfill that requirement. 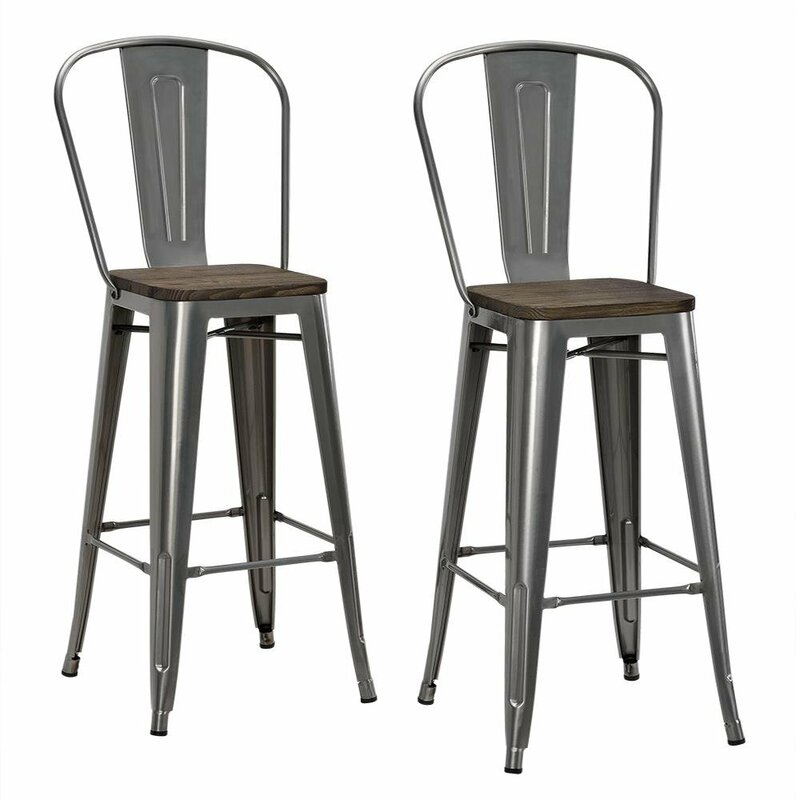 Despite the modern lines of these stools, the seat is distressed wood that adds to the item’s vintage bar stool look. These stools, however, only support 200 pounds, so they’re not for everyone. Still, for discerning people who are svelte enough to enjoy them, they make a fine addition to any home. 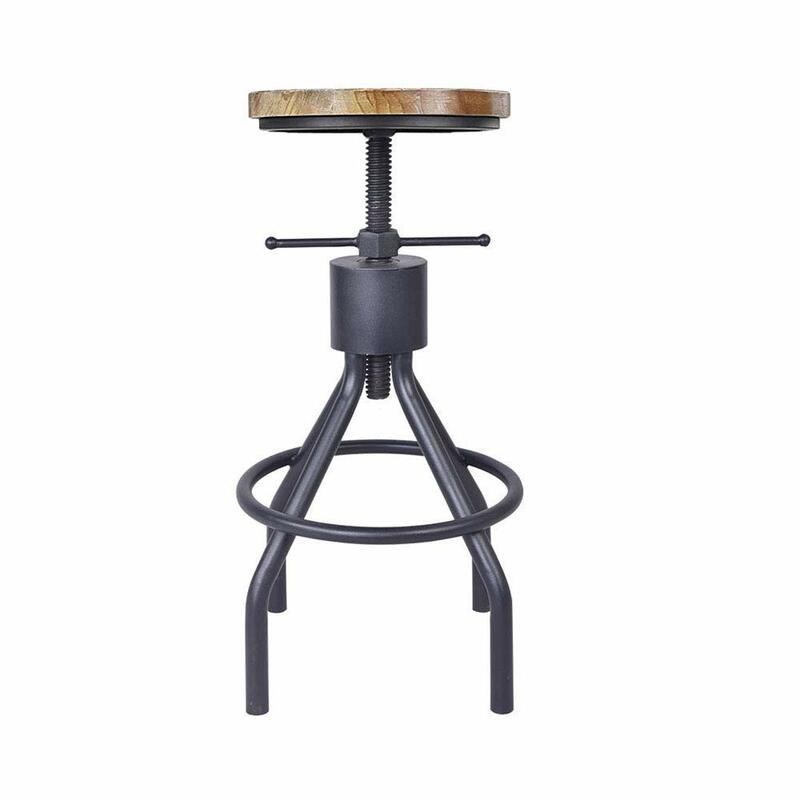 For an industrial look, check out the Vintage Living bar stool with the adjustable seat level. The seat adjusts with a swivel clamp, and both the frame and the support pipe are solid iron. Despite the almost steampunk nature of this stool, it nevertheless brightens any kitchen with its rugged charm and individuality. It comes with a one-year guarantee, too, so you can have peace of mind regarding your purchase. The Linon folding stool is perfect for people who either have small spaces or who like to travel by car. It’s fairly lightweight at 18 pounds and folds neatly for easy storage and transport. Additionally, it comes fully assembled. The dark wooden color and rakish style fit both the 21st century and a throwback era at the same time. The vinyl-padded seat provides extra comfort, and cleaning the stool is a breeze. Dorm rooms are notoriously short on space, so having a couple of folding stools in the closet makes for easy seating when entertaining guests. This foldable, solid-steel stool supports up to 300 pounds with ease and weighs just 6 pounds. You can even take it to class with you, if you’re in school because it’s comfortable and easy-to-tote. The materials of the stool are a cinch to clean, too, with just a rag and some mildly soapy water. Its ease of cleaning and portability make it an outstanding choice for home and office as well as school. 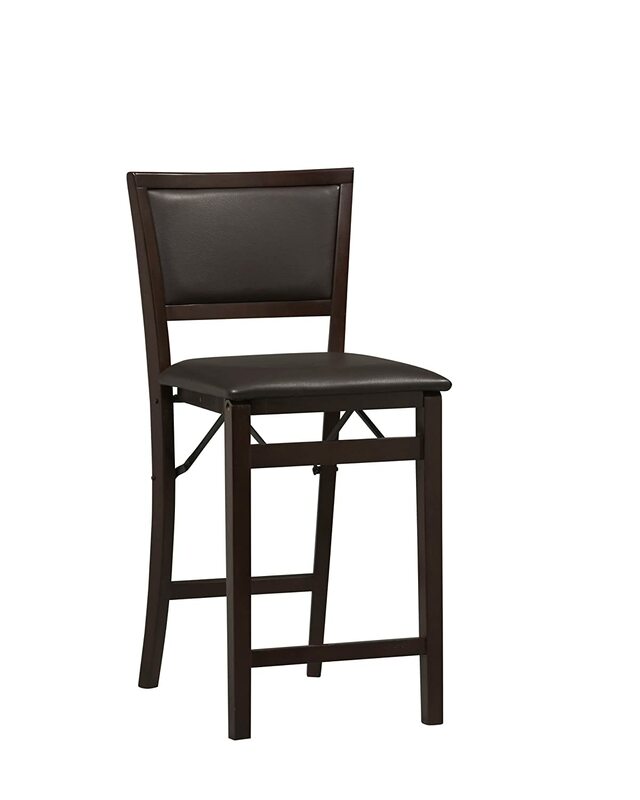 For a true pub experience, the Ashley Furniture swivel bar stool fits the bill. It’s nearly 4 feet tall and has a comfortable back. The old-school charm of the piece comes from the nail head trim around the seat cushion. The footrest is well-placed and comfortable. The stool requires some light assembly, and you have to have a screwdriver on-hand, but the instructions are clear and easy-to-follow. It’s firmly constructed, so you will get years of use from your new stool. Nothing gives the feel of a rustic pub more than an affordable bar stool the color of Napoleon. The deep, rich, reddish hue lends a feel of old-world class to this 4-foot-high stool. The swiveling seat is covered in polished faux leather, and the sturdy wooden frame is built for the long haul. The comfortable, high back is contoured to fit a person’s shape. The ultimate heavy-duty bar stool comes from Westman and the mind of Christopher Knight. 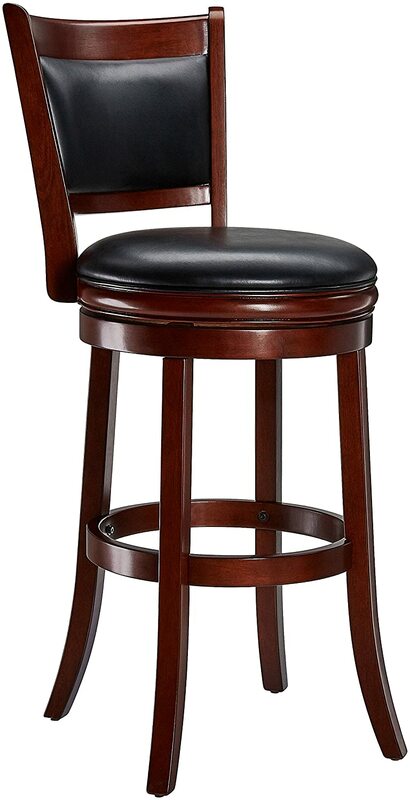 You might even say, “It’s the story of a lovely bar stool!” This stool has a full, cushioned seat with a fully upholstered back that would seem more at home on the floor as an easy chair than sidling up to a kitchen counter or bar. The stool weighs a hefty 57 pounds, but all of it is well-constructed from premium materials. For such quality, it truly is an affordable bar stool. 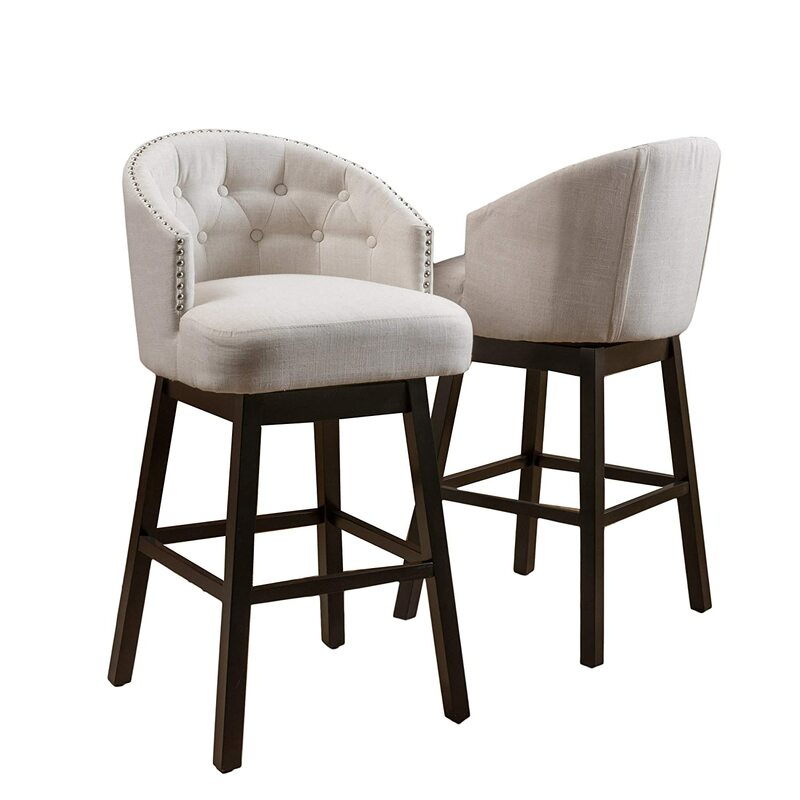 Bar stools are an exceptional way to customize your home. You can choose rustic, industrial, provincial, or many other styles. Most stools will fit in with any decor because they’re designed with middle-of-the-road colors, but a few will fit with some people’s wackier tastes. In all, you should pick such accouterments to fit your personality and taste. After all, your home is a reflection of you.